There is a long tradition in India of inter-weaving cotton webbing around a wooden frame and thereby making a cool airy bed perfect for hot weather. 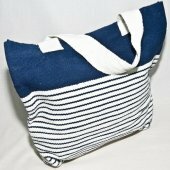 The cotton strips that make the webbing are traditionally woven by hand on so-called nawar looms. 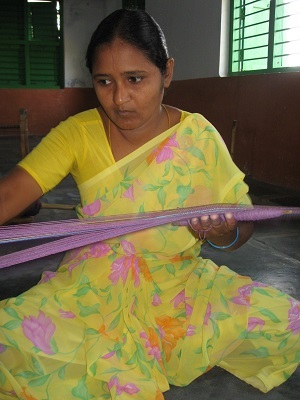 In Bethany Leprosy Colony when handloom weaving was first considered an alternative employment to begging in the late 1970’s nawar was the product of choice as back then there were no plastic nawar and the infrastructure costs were limited to a few small looms operated whilst sitting on the floor. 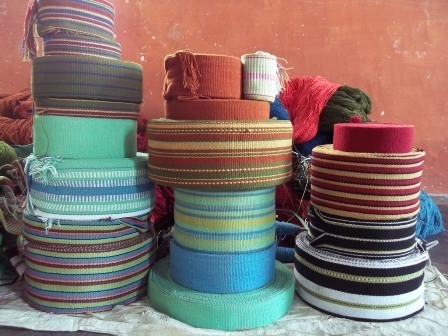 Over time and with the drop in demand for cotton nawar the rehab unit team in Bethany increased the width of the cotton bands, bright coloured yarn was introduced and tailors were trained to sew the tapes into the lovely bags that MESH still sells 30 years later. 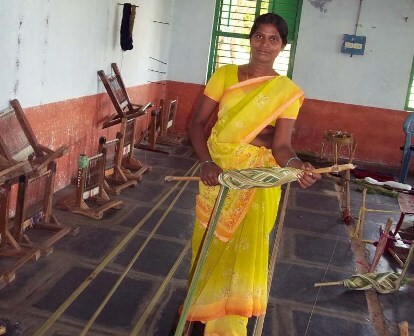 The process is fairly simple: A hank of dyed yarn is stretched over a rattan or crude wheel and two ladies walk up and down between pegs placed in the floor hooking the yarn around the pegs until there are long lengths of cotton yarn pegged down, this is the warp for the nawar loom. 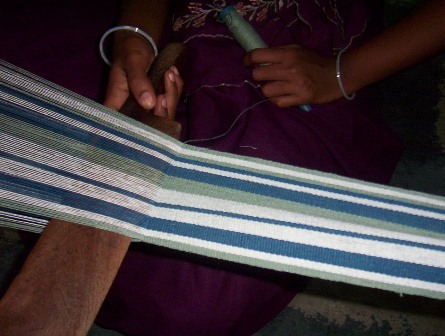 The warp is carefully lifted off the pegs and wound onto a thick chunk of bamboo or wood in an 's' shape. The warp is now ready for drafting and denting onto the loom. 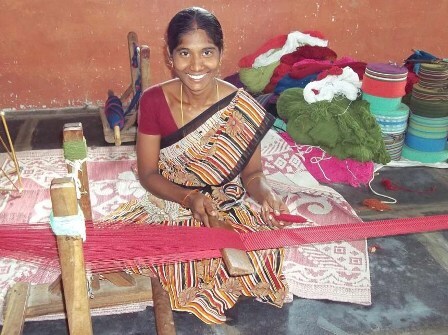 Each piece of yarn is threaded through a metal eye or between the metal eyes of the loom. 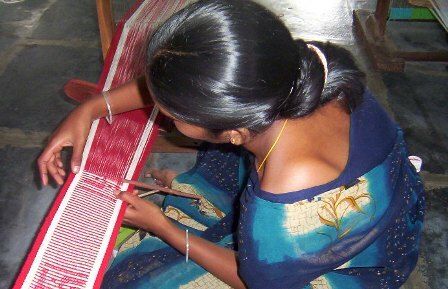 Two woman sit either side of the loom, one threading and the other receiving the thread. These are all knotted together around a wooden pole at one end of the room and separated out the other side of the loom and tied again to another pole at the other end of the room. 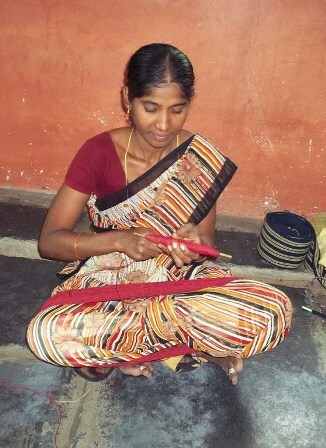 The weaver sits beside the loom and by pressing down the threads beside the loom or lifting them up she can separate out those in the eyes and those between the eyes making a shed to receive the bobbin and the beater. The bobbin is a twig with cotton thread wrapped around it which is passed between the open warp threads threads, beaten down tight and then the warp threads are lifted or pushed down and the weft thread is held in place. The weaver moves down the space between the poles weaving, and once she reaches the end she unties the warp, moves everything along, reties the warp and starts again. Simple, low-cost looms, a simple technique but the overall effect is pretty and strong. 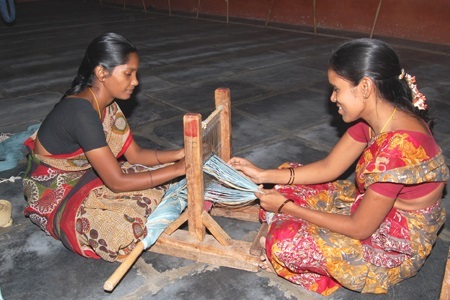 There are possible modifications created by the way the yarn is threaded on to the loom, the number of threads on the bobbin and also whether some threads are picked up by hand making patterns and shapes in the weave.